BUT BATS ALSO POLLINATE MANY PLANTS AND TREES! 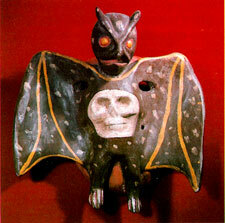 So the people of ancient Mexico also saw a good side to the bat - a symbol of fertility and new life. Some South American tribes believe the leader of the very first people was a hero bat or... BATMAN! A creature of the night, the bat has for obvious reasons been traditionally linked in Mesoamerican imagery and legends with darkness: its natural habitat of a cave - dark, sheltered and damp - provides an easy connection, not only with the mother’s womb and place of origin of humankind, but also with the underworld and world of the dead, according to many pre-Hispanic cultures. 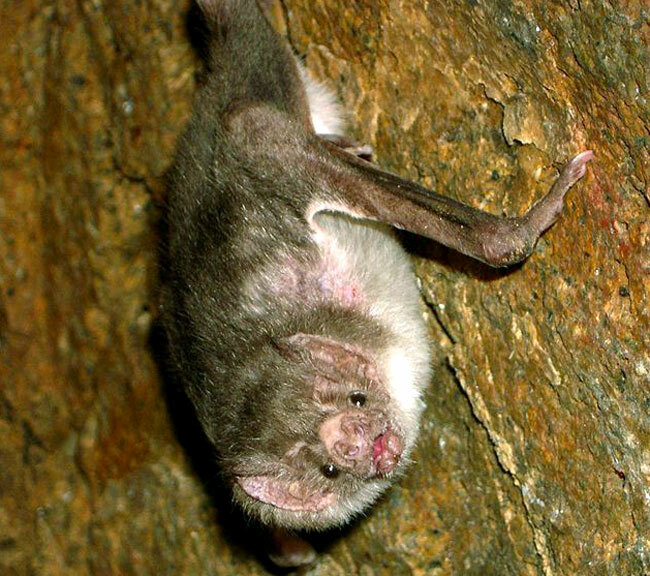 Some experts believe ancient Mexicans - particularly the Maya - may have made a link between the typical habit of a bat of grabbing fruit from trees and the ritual practice of decapitation: notice the presence of an obsidian blade of sacrifice at the very top of the stone bat image on the front of the famous Aztec altar of animals associated with darkness and death (the other creatures carved on the altar are a scorpion, a spider and an owl) (Picture 2). Esther Pasztory believes the paper rosette (lower left) on the head of the creature and the streamers (both of which appear on all four sides of the altar) depict the ‘tzitzimime’ - greatly feared star demons of darkness that dived head-first from the heavens. 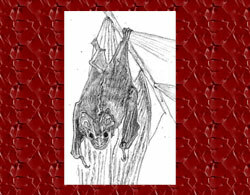 With the power of flight, the upside-down posture and the strong association with night and the powers of the dark, the bat is a creature that bridges the sky/heavens (above) and the underworld (below); not surprisingly, the bat has traditionally been cast as a supernatural creature with deadly powers. In the famous Quiché ‘Popul Vuh’ text, the death bat god of the underworld, Camazotz, uses his power to cut off the head of one of the Hero Twins. 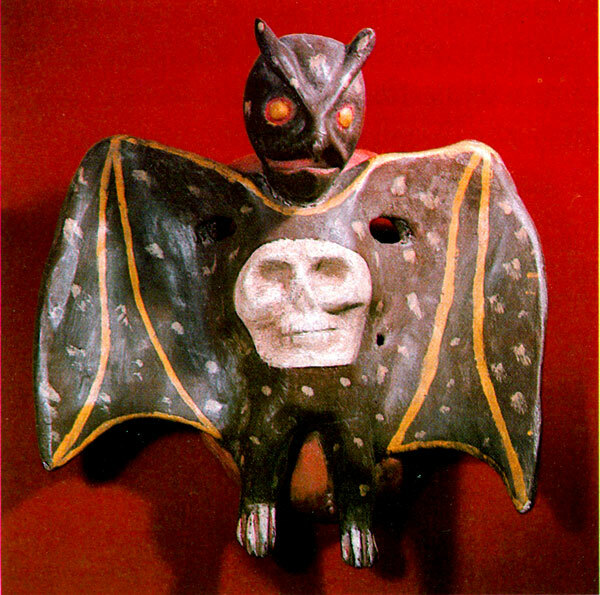 References to bat imagery go back as far as Olmec times (Mexico’s ‘mother culture’). 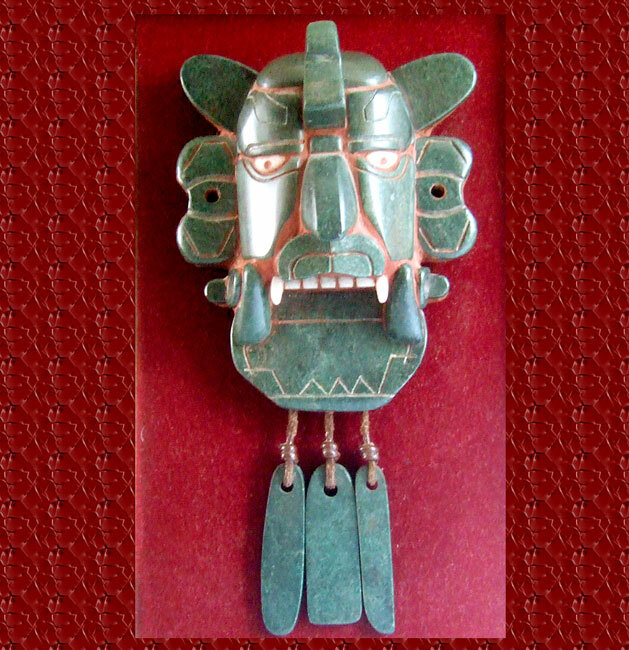 A strikingly beautiful bat mask, some 2,000 years old, was found in the early 20th century at the famous archaeological site of Monte Albán, near Oaxaca: possibly designed to hang from the belt or chest, this fine Zapotec bat figure, made of jade mosaic, shows some similarity to a jaguar (lord of the night) - though notice the large crest on the top of the forehead (Picture 3). In the beginning the earth was flat and full of water, and therefore the corn rotted. The ancient people had to think and work and fast much to get the world in shape. The birds came together to see what they could do to bring about order in the world, so that it would be possible to plant corn. First they asked the red-headed vulture, the chief of all the birds, to set things right, but he said he could not. They sent for all the birds in the world, one after another, to persuade them to perform the deed, but none would undertake it. At last came the bat, very old and much wrinkled. His hair and his beard were white with age, and there was plenty of dirt on his face, as never bathes. He was supporting himself with a stick, because he was so old he could hardly walk. He also said that he was no equal to the task, but at last he agreed to try what he could do. That same night he darted violently through the air, cutting outlets for the waters; but he made the valleys so deep that it was impossible to walk about, and the chiefs scolded him for this. “Then I will put everything back as it was before,” he said. • Main picture and Pic 5: Photos by Donald Cordry from Mexican Masks by Donald Cordry, ©1980; courtesy of the University of Texas Press. For some Latin American tribal peoples (such as the Toba from northern Argentina) the leader of the very first people, who taught people all they needed to know as human beings, was a hero bat or... BATMAN! 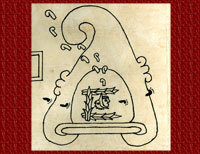 Spot ‘The Place of Many Bats’ in the Codex Mendoza! 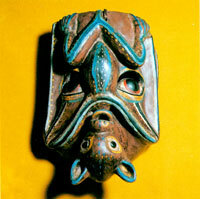 In pre-Columbian art bats are associated with death and sacrifice by decapitation. In the Quiche Popol Vuh, a bat named Camazotz cuts the head off of Hunahpu one of the legendary Hero Twins who journeys into the underworld with his twin brother to search for their father and uncle in the underworld and play a ballgame with the Lords of Death. Stone ballgame paraphernalia such as yokes, hachas, and palmas which may have been prized funerary offerings have been found in large numbers mostly around the Gulf Coast of Mexico and the Pacific Coast of Guatemala. 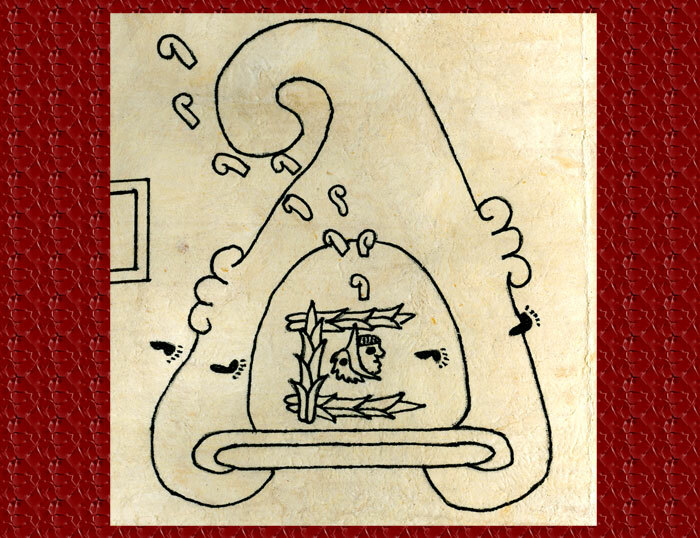 In the Magliabechiano Codex, there is an interesting story about Quetzalcoatl that has to do with a mythical bat that grew to life in the underworld from a stone in which the seed of Quetzalcoatl had penetrated. Quetzalcoatl is mentioned in the codex as being the son of Miclantecutli, the Lord of the Underworld and place of the dead. The bat that grew from Quetzalcoatl’s seed was sent by the other gods to bite the goddess Xochiquetzal, the goddess of flowers, and while she was sleeping the bat bit off a piece of her womb and took it to the other underworld gods. While the underworld gods were washing her flesh, water had spilled onto the ground causing many flowers to grow that smelled badly. 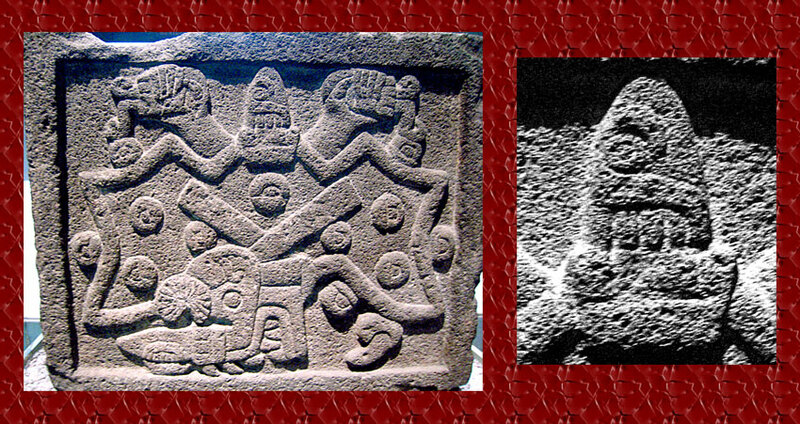 This may be a reference to Teonanacatl known to the Aztecs as “Gods’ Flesh”.